If you're a sucker and can't seem to pull yourself away from watching The Bachelor and The Bachelorette, you know there's always someone on the show that season that may have ulterior motives. Maybe there's a career to promote, maybe they have a girlfriend back home, or maybe they're just faking the funk for a free trip. If you're not one of these individuals, you take it upon yourself to be the hero, to tell the Bachelor/Bachelorette that someone is a wrong pick and doesn't deserve the love and affection, that someone is "not here for the right reasons." This season, I plan to track the Bachelorette's version of "I'm not here to make friends" and keep you posted on it's season-long usage. 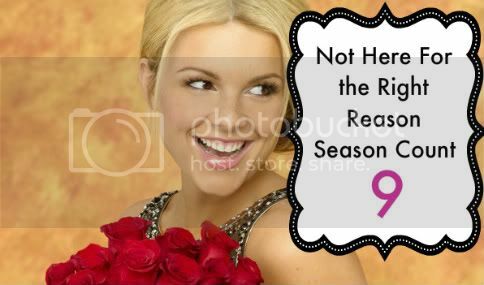 Ladies and gentlemen, may I introduce: The Bachelorette "Not Here For the Right Reason" Season Count. Now the big question for you readers is, how many times will the "not here for the right reasons" catchphrase be said? Vote now in the comments! Winner will be announced at the end of the season.